Jimmy Eat World formed in Mesa, Arizona, United States in 1993. They are associated with an array of genres including emo, alternative rock, indie rock and pop punk. Singer/guitarist Jim Adkins and drummer Zach Lind, who had been friends since kindergarten, joined forces with co-vocalist/guitarist Tom Linton and bass player Mitch Porter to try their hand at music. In its early years the band emulated the style of their punk rock influences, and they eventually recorded and released three singles and a full-length, self-titled album on local label Wooden Blue Records. The name Jimmy Eat World did not refer to lead singer Jim Adkins. Tom Linton's younger siblings, Ed and Jimmy, fought constantly when they were younger. Jimmy, who was stronger and heavier, would usually win. On one instance, Ed, as revenge, drew a picture with crayons of Jimmy shoving the entire world into his gaping mouth with the caption, "Jimmy eat world." The picture, and by extension the band name, may have been inspired by an episode of the cartoon show 'Tiny Toon Adventures', where the main characters put on a student film festival. Dizzy Devil's film, "Dizzy Eat World", was a 5 second piece drawn crudely in crayon where Dizzy's gaping jaw engulfed the Earth. In 1995 the band signed to Capitol Records. Around this time bass player Mitch parted ways with the band and was replaced by Linton's friend Rick Burch. After a brief scouting for producers, the band joined up with Drive Like Jehu drummer Mark Trombino to record their debut album Static Prevails. In 1998 the band entered the studio again to record their follow-up, Clarity. Clarity was released in 1999, the band released a video for Lucky Denver Mint, which also featured on the soundtrack for the film Never Been Kissed. The band was dropped by Capitol in 1999. They released Singles in 2000 and some splits. In 2001 working for a third time with Trombino, the band recorded the album Bleed American. After searching for a new label, they eventually signed with Dreamworks. The completed album was released in July 2001. The current issue of the CD originally known as Bleed American was re-released as Jimmy Eat World after the September 11, 2001 attacks. Four singles were released: Bleed American, The Middle (Reached #5 on the Billboard Hot 100), Sweetness (Reached #75) and A Praise Chorus (Reached #16 on the Billboard Modern Rock chart). The song The Authority Song was used as the theme music for the popular teen film 'Van Wilder'. The Middle landed Jimmy Eat World in the mainstream,and while Sweetness did a little worse, it still found success. Bleed American went platinum in a few months. 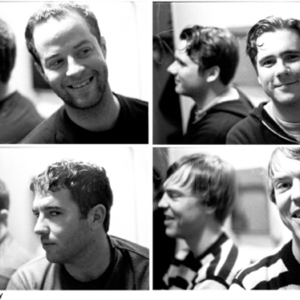 After lengthy touring in support of Bleed American the band regrouped to work on the follow-up in early 2004. Once again the band joined up with Trombino but the collaboration was short-lived. The band decided to part ways with Trombino, instead bringing in producer Gil Norton, well-known for his work with Pixies and Foo Fighters. Futures was released in October 2004 with lead single Pain immediately finding success in alternative radio and reaching #93 on the Billboard Hot 100. By this time, Dreamworks had been acquired by the much larger Interscope. Work and Futures became the other two singles to be released from the album, reaching #3 and #27 on the Billboard Modern Rock chart respectively. Simultaneous to the album launch was the release of a deluxe edition which included both the original album and demo versions of the same tracks. Additional demos from the Trombino sessions were later made available through the Jimmy Eat World Message Board, two of which, entitled Coming Home and Lying Dressed, would later become Disintegration and Closer, both of which featured on the Stay On My Side Tonight EP. Futures went gold by the end of 2004. In 2004, the song Just Tonight appeared on the Electronic Arts video game "Burnout 3", and later that year Pain appeared on the Activision title; "Tony Hawk's Underground 2" as well as Rockstar's "Midnight Club 3". The band later released an EP entitled Stay On My Side Tonight, released online on September 13, 2005, and on CD on October 4 of the same year. The EP featured songs recorded with producer Landon Stark as (unused) demos for the Futures album, as well as a cover of the Heatmiser song, Half Right and a remixed version of the song Drugs Or Me from the Futures album. After a lengthy tour with Green Day, a joint-headliner with Taking Back Sunday across the US and sold-out concerts in Europe, Australia and Japan, the band regrouped to begin writing the follow-up to Futures in February 2006. A video series entitled 'A World of Adventure' was made available through the band's website during the tour, focusing mainly on guitarist Tom Linton. Recording sessions for Jimmy Eat World's album, Chase This Light began on August 7, 2006. After a lengthy writing and recording period the mixing for this album began in June 2007. The lead single, Big Casino, was released on August 28 and the album itself on October 16. The album debuted at #5 on the U.S. Billboard 200 chart selling about 62,000 copies in its first week. It also contains the song Carry You, originally written for Jim Adkins' side project, Go Big Casino. The song Electable (Give It Up) from their 2007 album Chase This Light features in the Electronic Arts game "Burnout Paradise". The band's seventh and latest album, Invented, was released on 28th September 2010 with the second track, My Best Theory, being released as a digital download single on 10th August 2010. The reception was good and sold just under 40,000 units in the first week. The band's official website can be found at http://www.jimmyeatworld.com/.